Anchorage Aweigh is our exquisite 2 bedroom villa overlooking Coral Bay harbor. This adults only villa boasts a centrally located pool and large pool deck with picturesque views of Coral Bay, St John. Anchorage Aweigh villa is comprised of a main house with two master suites. If only one bedroom is desired, the upper bedroom will be available. If a second bedroom is desired, we will open up the lower bedroom. Both bedrooms are located on separate floors and allow maximum privacy. The maximum number of guests at any given time is four. It is a tranquil and serene setting with spectacular views of Coral Bay harbor, mountains and the historical 250+year-old Moravian Church. The villa has travertine marble floors, cable railing, air-conditioned bedrooms, outdoor stone showers, full kitchen, indoor/outdoor living and dining areas, a gas grill, laundry facility and a pool that is all tiled. All of the appliances are new and include a full-sized stainless steel refrigerator, gas range, microwave and dishwasher. Please note our calendar is accurate and up to date. The villa offers two equal king-sized bedrooms with gorgeous brand new furniture. The mattresses are Serta memory foam with cooling gel. The upper bedroom is on the main level. It opens out to a screened-in covered porch. The bedroom is air conditioned. The bathroom has a granite vanity. Attached to the bathroom is an outdoor stone shower under an open air roof. The second king bedroom is located on the lower pool level, facing the harbor. It has the very same amenities as the upper bedroom. It has a covered porch facing the harbor, which is not screened-in. The kitchen has blue pearl granite counters with an exquisite glass tile backsplash. It is filled with all of the amenities you will need to prepare many gourmet meals. There is an indoor dining table to enjoy should you decide to eat inside. The living room has two love seats overlooking both the church and harbor. There is a 12' sliding glass door facing the harbor for you to enjoy the panoramic views. There is a flat-screened television with DVD/DISH in here as well. The main house has an expansive wrap-around porch. We have an oversized sectional outdoor couch to relax and enjoy the view. There is also a dining table to enjoy meals alfresco. Sit and enjoy a cool drink on the breezy, covered porch while watching the sailboats bobbing on the harbor. From the living room, the pool and lower bedroom are accessed through an indoor set of stairs. Sunday mornings are a special time here. You’ll hear the church bells ring @ 9:30 am. The traditions of this historic, over 250 year old, Moravian church can be felt through the choral singing that drifts up the hillside. It’s an extraordinary experience you’ll not soon forget. Coral Bay is located on the quiet, mellow side of St. John. A 2-minute drive down the hill will bring you to a variety of shopping, restaurant and entertainment options. Beaches and the National Park hiking trails can all be found a short distance away. You'll definitely want a rental car so you can take advantage of some of the most pristine views of the lush, tropical hillsides and aqua blue seas. The 'busy' town of Cruz Bay is a 20 minute drive away. This house has been an ongoing dream of ours and we have taken great pride in the construction of it. You can see our hard work on our blog that can be found on Google. We have completed a gorgeous 10 x 20 mosaic tiled swimming pool overlooking the harbor, with a 600 sq. ft. pool deck and adjacent tropical garden. Part of it is shaded by a huge royal palm tree and part is under cover of a shaded porch. The pool is a saline pool - meaning there is very little chemical use. Your hair, skin and clothing will not be affected as they might with a chlorinated system. Adjacent to the main house, yet completely separate, is our cottage. It is a one-bedroom unit that is our living quarters while we are in St. John part-time. The main house and cottage were designed with privacy in mind. As you can see in the photographs, both houses face in different directions. As you can see from our reviews, Anchorage Aweigh has become a popular vacation destination. We hope that you will find our villa, and the island of St. John itself, a wonderful place for your holiday. We are two former elementary teachers from Alaska. We have been working on our dream for the last eight years and it is finally finished!! We are very proud of our accomplishment. We hope you find St. John and Anchorage Aweigh Villa as special as we do! A really beautiful place sitting on a hill over Coral Bay. They have all you need, updated appliances, good WiFi, and a great pool. Loved staying there and nice to see St John itself has really come a long way since the hurricanes. We would definitely stay here again! Thanks! We loved every single thing about our stay at Anchorage Aweigh! Annette was timely in her communications and super accommodating. The villa is everything you see in the pictures and more! The views are breathtaking, with lovely breezes from the many large windows and stunning covered deck. We spent much of our time out there, and ate all of our breakfasts and dinners at the outdoor table. We loved how close we were to the beaches we love , and after days spent snorkeling and sunbathing, we spent several relaxing afternoons lounging by the pool. It was so refreshing! The villa has everything you could think of, plus loads of other clever items to have on hand. We loved the location—just above Coral Bay, but far enough above so that the live music from Rhumb Lines and Pickles in Paradise were just like background music. We can’t wait to plan our next trip to St John and Anchorage Aweigh! I loved the VRBO. Nicely appointed. AC was great in the bedrooms and breeze was nice during the day. Loved the pool and the stars were amazing at night. Coral Bay is a wonderful place to stay with Skinny Legs and Aqua Bistro. Grocery store is very convenient. Loved my stay. Thank you for your kind words. We are so happy that you enjoyed your stay at Anchorage Aweigh. We hope to see you visit again one day! Wonderful month at Anchorage Aweigh! We spent a wonderful month at Patricia and Scott’s rental home. The place was very comfortable and spotless. The kitchen was fully stocked with everything you needed, which was important to us, because we ate many of our meals there. With the beautiful view on the deck, why not? We loved having the pool after a long day snorkeling or at the beach and the temperature was just right. We also liked being on the quieter side of the island where we were only 15 minutes from any of the North Shore beaches or East End beaches and the market was just down the hill. Patricia was a wealth of information, giving us directions to the best beaches, snorkeling spots, and restaurants and Pete and Annette were right there if we needed anything. We will definitely be going back in the near future! Good day, Barton and Lorraine. Thank you for your kind review of our villa Anchorage Aweigh. We are so happy that you enjoyed your stay and your vacation as a whole. Coral Bay is a very special place. We look forward to your return to the beautiful island of St. John! Blessings! We really enjoyed our stay in this wonderful villa. The view is exactly as pictured and the house is well maintained. Our thanks go out to Annette and Pete for taking care of us while we were there. It had outside showers which we love in St John. The villa is located up the hill above Indigo Grill and close to Skinny Legs. We loved the location being close to town (if you want to call it that) but not right in the middle of it. The donkeys, goats and chickens sounding off at various times of the day adds to the charm of Coral Bay. We would definitely stay here again and recommend it to anyone looking for a less touristy St John experience. With everything that has taken place on the Island, The Villa was delightful. Weather was great and beaches were in very good shape especially what has taken place over the last 9 months. Most restaurants were open and food was very good. There is still quite a bit of work that needs to be done but the Islanders along with Scott and Patricia are resilient and determined. Very nice trip ! Well, we are glad that you enjoyed your stay. 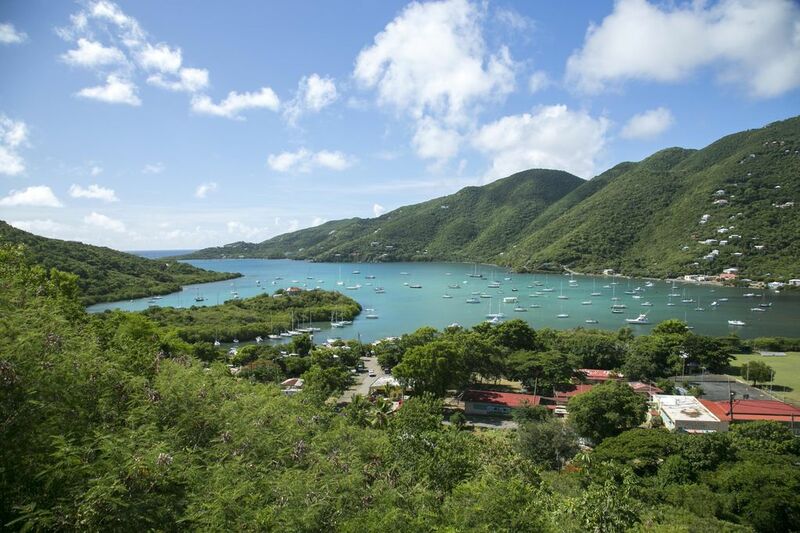 We agree that St. John has some recovery in its future. However, we do want to point out that our villa is 100% complete with no repairs needed. Thank you for your review.